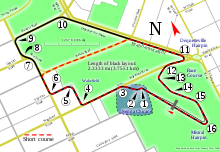 The 1991 Australian Grand Prix was a Formula One motor race held on 3 November 1991 at the Adelaide Street Circuit. It was the 16th and final race of the 1991 Formula One World Championship. Torrential rain resulted in the race being stopped after just 16 of the scheduled 81 laps had been completed. Confusion caused the official results to be declared from the end of the 14th lap. It holds the record for being the shortest Formula One World Championship race ever held. The race was won by Ayrton Senna, with Nigel Mansell in second position, and Gerhard Berger's third-place finish plus Senna's victory meant that the McLaren team clinched the Constructor's championship. Mansell was unable to take part in the post race podium ceremony, following a crash at the end of the race that left him requiring hospital treatment. Because less than seventy-five percent of the scheduled race distance had been completed, only half the normal World Championship points were awarded. This was also the final Formula One race for three time World Champion Nelson Piquet. It was the 60th pole position for Ayrton Senna. Ferrari terminated Alain Prost's contract with the team following his public criticism of them. His raceseat was taken by Gianni Morbidelli, the Ferrari test driver. After being dropped by the Jordan team two races earlier, Roberto Moreno returned to Formula One to take Morbidelli’s place at Minardi. Benetton did not renew Nelson Piquet's contract with the team, and Australia would be his last Formula One race. Bertrand Gachot returned to Formula One after completing his jail sentence in Britain, replacing Éric Bernard at Larrousse, who had been injured at the previous race meeting in Japan. The Coloni team were entered for their final Grand Prix, new owner Andrea Moda had confirmed that the team would be reborn as Andrea Moda Formula for the following season. Pre-qualifying took place in sunny and dry conditions on Thursday afternoon instead of Friday morning to expand the race meeting to four days. Gabriele Tarquini failed to pre-qualify as his track time was limited after a left rear suspension failure on the exit of turn 11, which turned his car into the wall. Naoki Hattori ended the season for Coloni with another pre-qualification failure, which they had achieved in every race meeting they had attended in the 1991 season. Hattori's best time in the session was a 1:22.852 which was 5.145 seconds slower than the fastest man in the session Martin Brundle, on a 1:17.707. Hattori would not get another chance in Formula One after this event. The sunshine continued for both the remaining qualifying sessions on the Friday and Saturday. Aguri Suzuki crashed heavily at turn 1 which contributed to his failure to qualify. His new teammate Bertrand Gachot also did not progress through qualifying. Martin Brundle, having finished in the points in the last race and pre-qualified fastest on the Friday, surprisingly struggled and failed to qualify in his last race for Brabham-Yamaha. Stefano Modena also crashed in qualifying but was unhurt and able to take the race start on Sunday, having already set a time that was sufficient for him to secure a place on the grid. McLaren managed to qualify both their cars on the front row of the grid with Senna in pole position. Nigel Mansell and Riccardo Patrese, in the two Williams-Renault cars, occupied the second row. Benetton occupied the third row with Nelson Piquet out-qualifying Michael Schumacher for the only time in the 1991 season. Gianni Morbidelli qualified in 8th position, only one place behind Jean Alesi in his first race for Ferrari. In his first race for Minardi-Ferrari, Roberto Moreno also managed to qualify 18th fastest. In the torrential rain (which had been falling since halfway through the Group A touring car support race earlier in the day), the race started mostly without incident. Riccardo Patrese lost two places at the start and emerged behind Jean Alesi’s Ferrari but there were no accidents in the first few laps. However as the race continued into lap 3 Gerhard Berger, unseen by the television cameras, ran wide which allowed Nigel Mansell to move up to second position, but rejoining in third. Mansell then proceeded to quickly close the gap to Ayrton Senna in first place. But by lap 5 the incidents began to occur which would affect Mansell’s ability to pass Senna. This was because so many yellow flags were being displayed by the marshals around the extremely wet circuit. On lap six Mansell moved alongside Senna on the Brabham Straight but quickly saw a wave from a marshal, who was leaning out from the barriers, to warn of wreckage ahead. Nicola Larini’s Modena-Lamborghini had crashed on the straight and was lying across the track. Mansell had to abandon his line and rejoin the racing line behind Senna, who had also had to avoid Jean Alesi’s stricken Ferrari, which had also crashed yards after Larini on the other side of the road, as did Schumacher's Benetton who also spun off on the side of the road. Pierluigi Martini’s Minardi car aquaplaned on the Brabham Straight on lap 10, which sent his car straight into the right hand wall and rebounded to the other side of the track before eventually stopping out of the drivers' way. This indicated that the rain was beginning to fall even harder, and more torrential than before. Riccardo Patrese was struggling with his car because a front wing, from another car, got stuck towards the front of his undertray. This was spotted by James Hunt in the BBC race commentary, although Murray Walker had suggested earlier that it was the undertray that was loose. Mansell then, as a result of the increasing downpour, spun off on the start of lap 16 on the Wakefield Road straight, before turn 3, having "instantly gone out of control" according to Mansell himself. The torrential downpour also made Michele Alboreto spin out of the race on lap 15 as well as Stefano Modena, in his last race for Tyrrell-Honda, although he continued. Nelson Piquet also spun at the high-speed Stag turn but was able to recover and he continued as well. Gerhard Berger spun off at the end of lap 16 having just recovered from an earlier spin at the Malthouse Corner moments before. Murray Walker said that the weather was becoming worse and the rain was lashing down on the start/finish line. Just after this happened Senna drove onto the start/finish straight and gestured to the race officials, as he went past, to try to get the race stopped. Moments later, with Senna on lap 17, the race was finally stopped. By the end of lap 16 the race order actually was Senna in 1st from Piquet, Morbidelli, de Cesaris, Zanardi and Modena. However, the race officials decided to count back to lap 14 despite the 1991 ruling that early race stoppages should have been counted back one lap. This incident was similar to the controversy of the 2003 Brazilian Grand Prix, where computers finalising the race concluded the result a lap too early. There were attempts to restart the race from the officials, who showed their determination to do so by ordering the 10-minute warning board to be displayed to the drivers and teams to indicate a race restart. But after serious protests from Senna and Riccardo Patrese (who stormed up to the race stewards to argue against a restart), the race was finally abandoned for good. Roland Bruynseraede eventually waved the red flag to indicate the stoppage to the spectators, drivers and teams. As a result, Senna was declared the race winner from Mansell and Berger. I don’t think that was a race, it was just a matter of staying on the circuit, and there was no point to try to go quick at all. It was impossible! We had a race, a very bad one, here a couple of years ago and then was impossible [in reference to the 1989 Australian Grand Prix, which was run under identically treacherous wet conditions] and today was even worse! There was even more water on the back straight. Senna and Berger both revealed at the press conference that they would not have started the race if this race did not determine the Constructor's Championship, as the McLaren and Williams teams both went into this race with a chance of winning the championship. When Stewart asked him if they should start a race if ever faced with those type of wet conditions in the future, Senna's reply was a firm "No, they should not start the race", though he understood the pressure that was on the officials and teams to start. He then added that the officials should not be held solely responsible as the drivers, including himself, chose to get in their cars and start the race so they should be held equally responsible. Nigel Mansell, after being helped from his Williams-Renault commented that “everything was ok other than it was a complete joke, I mean there was debris all over the place. I've got a headache like there's no tomorrow, so I've probably had a little bit of a concussion”. He also made reference to the fact that “there was a truck down the straight” as well as four cars and, as a result, the race should have had 10 laps to be stopped. With less than seventy-five percent of the race distance being completed, half the usual world championship points were awarded, the first time this had happened in Formula One since the wet 1984 Monaco Grand Prix had been stopped just before half distance. Senna and Berger's result was enough for McLaren to win the 1991 World Constructors Championship by 14 points over Williams. This was McLaren's seventh constructors championship, and their fourth and last championship won with engine partners Honda. ^ "Sports People: Auto Racing; Prost is dropped from Ferrari team". The New York Times. The New York Times Company. 30 October 1991. Retrieved 24 March 2009. ^ "Enzo Coloni's F1 adventures". Archived from the original on 3 March 2016. Retrieved 16 April 2010. ^ Saward, Joe (7 November 1991). "Australian GP". Autosport. Haymarket Publications. 125 (6): 25. ^ a b c d FIA Formula 1 World Championship – 1991 Season Review (VHS). Duke Video. 11 December 1995. Retrieved 24 March 2009. ^ a b c Walker, Murray (Commentator) (3 November 1991). Classic F1 - Australian Grand Prix 1991. London, England: BBC. Archived from the original on 27 March 2009. Retrieved 24 March 2009. ^ a b "1991 Australian Grand Prix". formula1.com. Archived from the original on 3 November 2014. Retrieved 23 December 2015. ^ a b "Australia 1991 - Championship • STATS F1". www.statsf1.com. Retrieved 6 March 2019.